This was originally guest-posted on Josashimi, but as I’ve been missing in action for a couple of weeks and am going to be struggling to keep up, I’m breaking the cardinal rule of blogging and re-using a post…. Kuihs (the correct plural is kuih-muih) are the quintessential colourful Malaysian desserts. I don’t recall eating them as dessert though, they were always snack food, – eaten on the go during the day or during supper, washed down with a hot mug of fresh soybean milk. They are typically steamed and made from rice or glutinous rice flour (though some are also made from tapioca flour, mung bean flour, etc). The range of kuihs is massive; some are specialties of specific regions of Malaysia, and come in all shapes and patterns, sweet or savoury, with or without fillings, steamed or baked or deep-fried. You can bet there is a kuih to satisfy the pickiest eater! 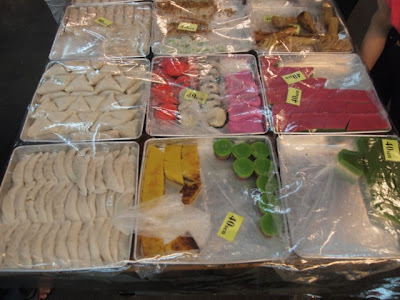 A small selection of kuihs (or kuih-muih) from a hawker centre in Kuching. 40 sen equates to NZ$0.17/AUD$0.13. In Malaysia, kuihs are readily available from the night markets and various hawker stalls around town, which understandably resulted in most Malaysians never learning to make them. That is, until we left Malaysia and realized how difficult it is to procure these little gems. When you do find them, invariably they don’t taste right and are horrendously pricey (NZD/AUD$1- 1.50 for a small piece). The big secret is that kuihs are actually very easy and cheap to make. Most of them don’t need any special equipment. Kuih lapis is a favourite of most children, who slowly peel off the layers one at a time, and nibble at them. It’s actually easier to make kuih lapis these days with pandan paste (rather than having to pound and squeeze pandan leaves for their fragrant, green juice), and using silicon bakeware (no dreaded sticking!). Equipment: Steamer (I used a wok), 23cm diameter non-stick tin (not springform, – should not have gaps for the mixture to flow through)/ 23 x 23cm square tin. Silicon bakeware will ensure your kuih will not stick to the tin. Mix A well and put through sieve into large bowl to ensure there are no lumps. Put B in a saucepan, and bring to a boil to dissolve sugar. Pour B into A and mix well. Divide into 3 equal parts (570g each). Add ½ tsp pandan paste to one, and ¼ tsp red food colouring (note, put in drop by drop until you get your desired colour) to another. Weigh out 190g of each colour. Steam the layers for 5 minutes each, starting with red, green then white, and repeat. Layer should be firm to touch before pouring the next layer. For the final layer, steam for 20 minutes. Cool for at least 2 hours, then slice with a plastic knife or a clingfilm-covered metal knife.